You’re place or ours? First Aid Training Courses can be arranged at your location or at our central training facility. Professional but Casual Canadian Red Cross First Aid Instructors. Unsure what First Aid Course or CPR course you need? Contact Us to find out more. Currently we offer 10 different combinations of First Aid and CPR courses; and you only need 1. 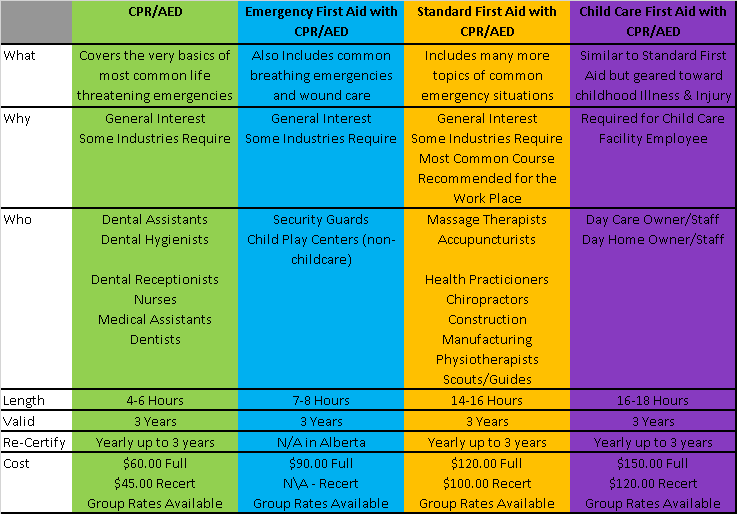 If you are unsure as to what level of first aid you require you can follow this guideline; however you will want to validate our recommendation with your workplace first aid requirements as set out by Alberta Occupational Health and Safety, or with your professional organization. The following information is for a general information purpose only, and does not indicate the exact type or level of training you need or require. A recertification is a shortened overview course designed to update, cover missing points and strengthen skill and retest currently certified individuals. If you hold a First Aid/CPR certification from a recognized Organization (Canadian Red Cross, St. John’s Ambulance, Heart & Stroke, Canadian Ski Patrol, National Lifesaving Society) that is within the certification period you make take a recertification course. Recertification extends your certification period to three years past the recertification course date. Knowing what course you need to take may not be easy. If you are wanting to enhance your resume by having safety certifications, Standard First Aid w/ CPR Level C is your best bet. It is an industry recognized certification and shows initiative to get the right training. This course is the mandatory First Aid certification for Workers, Owners and Volunteers in Infant and Child youth care facilities. CPR Level A, B, C,.. which one is right for me? Please check our “What’s the Difference?” section below to get further information on what the different levels of CPR mean. If you are even unsure of what level you need, you can always contact us or take CPR Level C, it is the most widely required. Here’s a quick synopsis. Click on each name below to be taken to the official page with course syllabus. Covers EFA Content plus many more major and minor injuries and medical emergencies including Head and Spine, Bone, Muscle and Joint, Environmental and Sudden Medical Emergencies, Poisons. Teaches CPR and AED skills for Adults. This level is a stand alone course or included as 1 of 3 options with Emergency First Aid and Standard First Aid training. While Alberta and Federal Occupational Health and Safety have requirements for the minimum amount and level of first aid trained individuals that must be present at the jobsite or primary place place of business, there are many other reasons why a person may need or want to take a first aid course. Many professional memberships and colleges require those holding certifications and designations to obtain and uphold valid first aid and CPR certification. These memberships and colleges are primarily in the health care field and comprise Dental Assistants, Dental Hygienists, Massage Therapists, Physiotherapists, Acupuncturists, Nutritionists and others. People have chosen to take first aid training across the world to learn the skills necessary to save a life, whether for a close family member or friend in a higher risk condition, to have the skills to serve on the basis of humanitarian need, or to enhance their resume when looking to secure employment. Having your certification in First Aid and CPR is always recognized as a imperative skill to have. You can either join us at the Winston Heights Community Association in Calgary AB, for one of our public first aid courses, request a private first aid course for your group/corporation at the community hall, or we can come to your place – office, workshop, or house and bring our training gear with us. Impact Training & Consulting offers First Aid Training and CPR Courses in Calgary, Airdrie, Okotoks, Chestermere, Cochrane and through out Southern Alberta. †. Certification is based upon standardized course content set out by the Canadian Red Cross.